Lucas Pastuszka is a local Bay Area Tax and Estate Planning Attorney at Temmerman, Cilley & Kohlmann, LLP and serves as Planning Commissioner for the City of Saratoga, CA. I have been a huge Batman fan since the age of two years old when I watched my first Batman: The Animated Series episodes. Batman has always been an inspirational hero for me, because, unlike superheroes, he was ordinary and self-made. His only superpowers were the strength of his mind, perseverance, and the will to act. Batman is a symbol of hope who teaches by example and reassures us that there will be light and good will prevail. Like the rest of us, because he has no superpowers, Batman has limitations that require him to make difficult moral and ethical decisions, but he always makes the right one and his will to act allows him to overcome any obstacle. He is truly one of the most symbolic and inspirational heroes ever created. One of my favorite quotes from the Dark Knight Trilogy is part of a conversation Bruce Wayne (Batman) has with Alfred, his butler. “People need dramatic examples to shake them out of apathy. I can't do this as Bruce Wayne. A man is just flesh and blood and can be ignored or destroyed. But as a symbol... As a symbol, I can be incorruptible, everlasting.” Bruce Wayne, the billionaire, appreciated the limitations society artificially imposes on individual human beings and became a symbol that could transcend his lifetime and continue to inspire and encourage well into the future. When I turned twenty-one, I wanted to spread the magic of Batman that made me so passionate about the character and defined my childhood. I wanted to make Batman real and to become the symbol that inspired, encouraged, and prevailed against all odds. I wanted to inspire hope and spread joy. 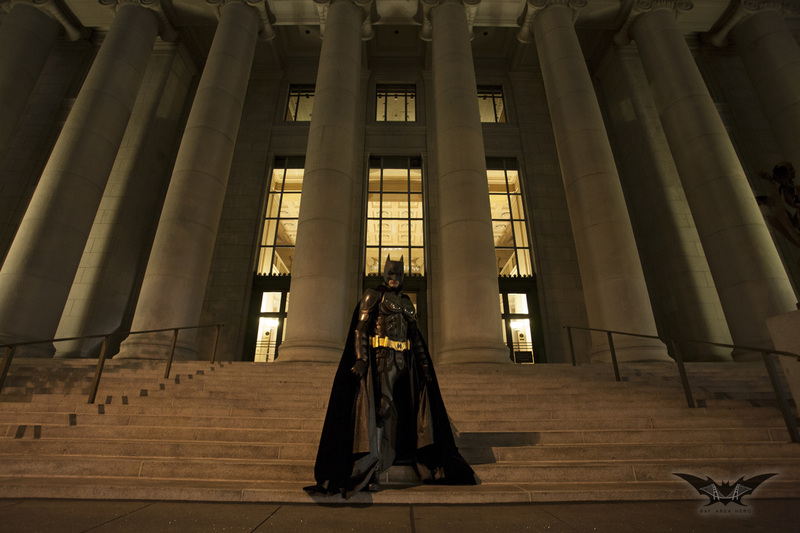 I chose to act on this desire, by become the most realistic Batman possible and volunteering my time visiting children suffering from life threatening medical conditions at local hospitals and volunteering for other meritorious causes as the Bay Area Hero. Yes, this was me in 1st grade in my first Batman costume. I continued being Batman for Halloween for eight consecutive years. The suit on display in the bat-armory. I knew from the beginning that I did not want to show up at hospitals wearing a Halloween quality costume, because the only person I would be fooling would be myself. If I was going to do this, I was going to do it right. Originally, I put together my own Batman costume and even learned to use a sewing machine to sew together a large pleather cape with a 12' wingspan, but the costume was only suitable at convincing children up to about six years of age. I decided I needed an upgrade, so I began attending private events and children's birthday parties to raise money for a perfect replica Batman costume and other necessary equipment for these hospital visits. I finally raised enough money and ordered the ultimate armored leather and Kevlar custom Batman suit. This suit is now the official suit of the Bay Area Hero and I will focus on volunteer work! Please note: My intention is to volunteer primarily for children's events and visit local hospitals. Although I am open to volunteering at other events, I will only attend events were my appearance directly benefits the participants/attendees of the event. I will not volunteer for fundraisers, promotional events, or any other events were the goal is to simply raise money or awareness for some cause and my appearance serves as a means to an end. I also reserve the right to refuse to attend any event for any reason. If you have any questions, would like me to visit your child, hospital, or event, or would like to support Bay Area Hero, please contact me through the “Contact the Hero” page!